The Silly Suitcase assortment gets a fresh new look for fall 2011 with the newly styled Potato Head characters. 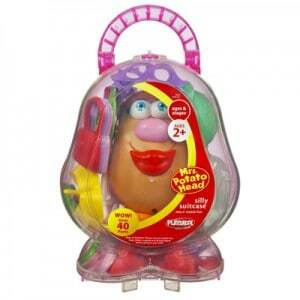 Create hundreds of different Potato Head combinations to keep little ones giggling for hours. Each suitcase is packed with 35 different body parts and accessories for almost endless silly styles! Choose from a blue Mr. Potato Head case or a pink Mrs. Potato Head suitcase; each sold separately. The Mrs. Potato Head Silly Suitcase is recommended for ages 2 and up. It retails for under $17 at Amazon.com. Both Mr. and Mrs. Potato Head are also available at Target.com.